Display Flop. We now test the "successor" of the Envy 14-1010eg's glorious Radiance Infinity Display with quivering hands. Can the processor upgrade and the Beats Audio Sound make up for the LG screen's new "qualities"? 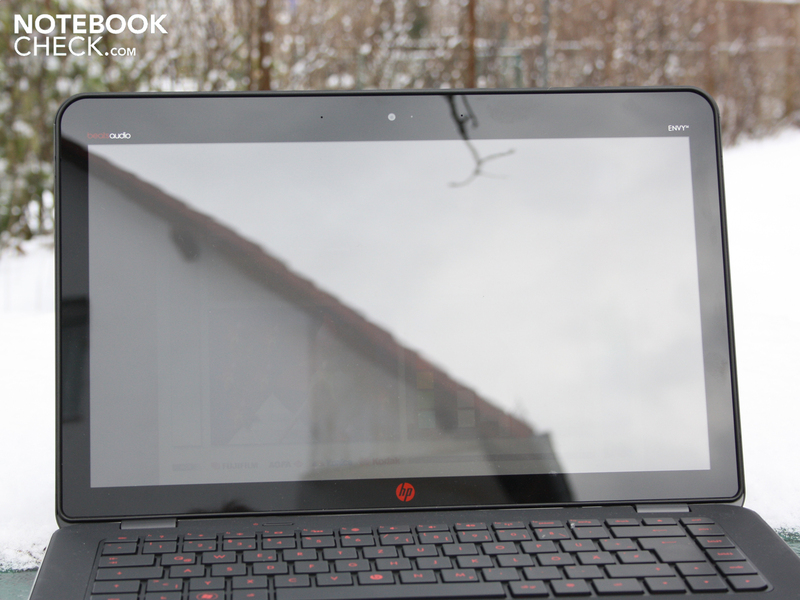 HP Envy 14-1190eg Beats Edition (XE653EA): Just how good is the 14 incher without Radiance Infinity Display? There's been a big hype about HP's Envy series. The manufacturer wanted to create a new top product, for which "prosumers" (marketing jargon) are willing to spend a lot of money on. The 13, 14, 15 and 17 inch devices are now to be on par with Apple's MacBook Pro laptops. However, the devices weren't able to score downright positively on the editorial front. 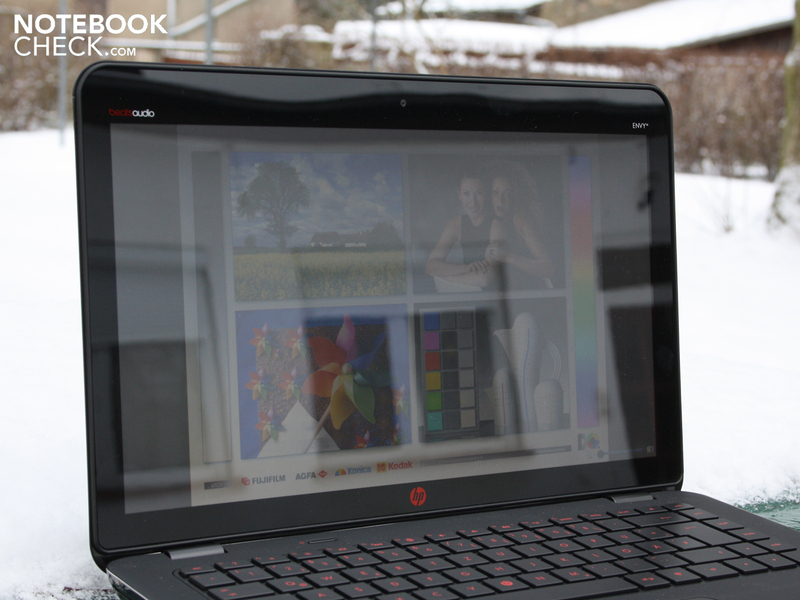 First, the Envy 15-1090eg (Core i7-720M) disappointed with low brightness and high noise under load (test 11/2009). 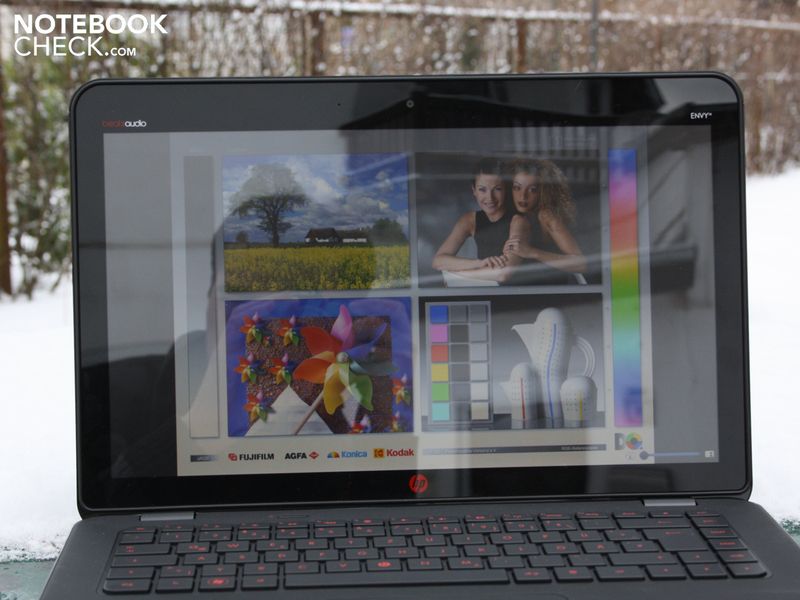 Many months and countless of test inquiries later, the HP Envy 14-1010eg triumphed with a color, contrast and brightness rich Radiance Display (test: 8/2010). The editorial offices were jumping for joy and the annoying noise was almost forgotten. In between, HP shocked Envy 14 fans by announcing the Radiance Display wouldn't be installed in the 14 incher any longer. Now, it's here, facing us. 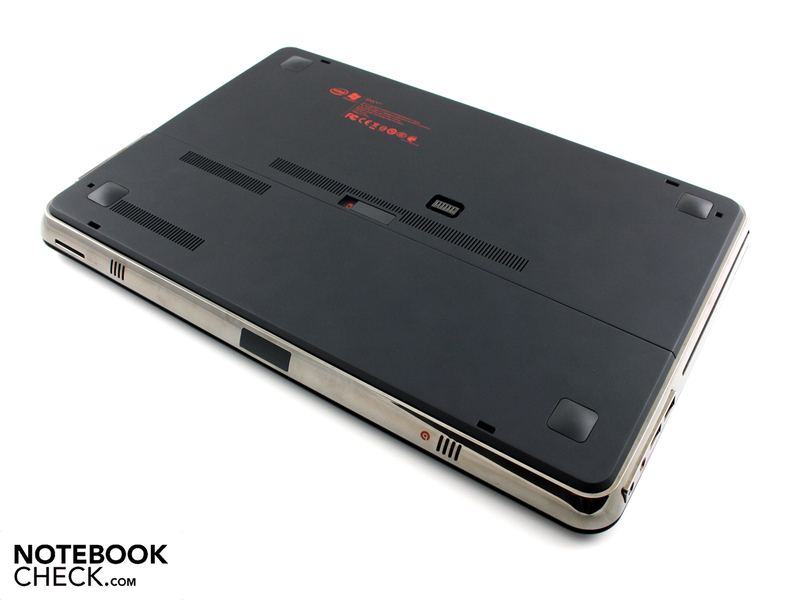 An Envy 14-1190eg Beats Edition – without that brilliant display in our first review. What capabilities does the "new" display incorporate? 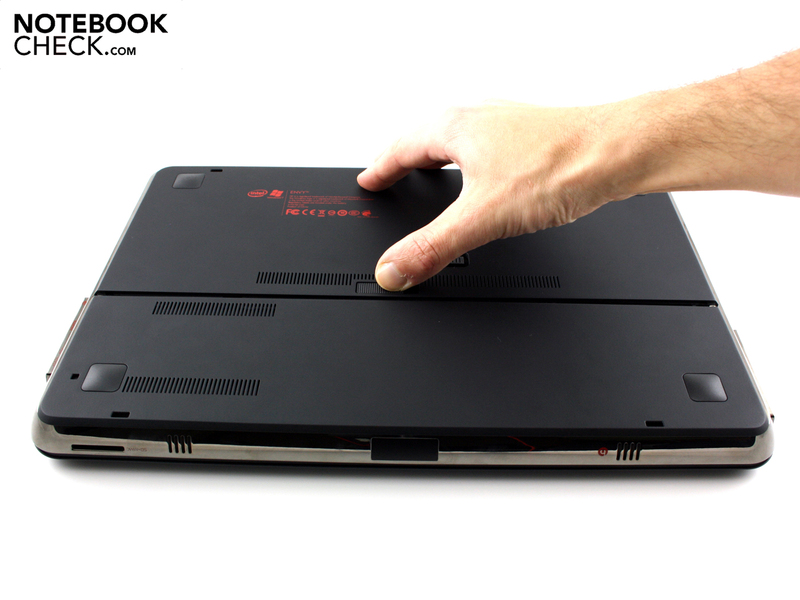 How much premium notebook will be left after high-end workmanship and strong components? Is the Radeon HD 5650 still downclocked? How much battery life will the 2.66 GHz processor, Core i5-560M allow? And are the included headphones everything that the Beats Edition has to offer at a price of 1800 euro? This review answers all burning questions. Let's keep it short: The high-end qualities of the previously reviewed Envy 14-1010eg have been completely maintained in the 14-1190eg. The stability is still excellent and beyond any doubt. Even first-rate details, like the rubber lip around the edge to edge display and the hinge's high closure force have been preserved. What has changed is the looks and feel of many surfaces. The 14 incher is still made of metal components. However they now have been coated (lid) or rubberized (work surface). While our hands felt a diamond-shaped texture on the wrist-rest and display lid, these are now velvety soft (wrist-rest) or smooth and matt (lid). There is still a chrome strip around the base unit and, unlike the otherwise matt surfaces, attracts fingerprints. Furthermore, our 14-1190eg still differs from the MacBook by the aluminum cover, which reveals the battery and the 2.5 inch hard disk on the bottom. The plate has an accurate closure and fits tight, but the unibody stiffness isn't achieved. The good connectivity is continued and hasn't been upgraded in anyway. Even the network and wireless modules are the same (Broadcom abgn, Gigabit LAN and 2.1 Bluetooth). The description below the following pictures lists the exterior interfaces. 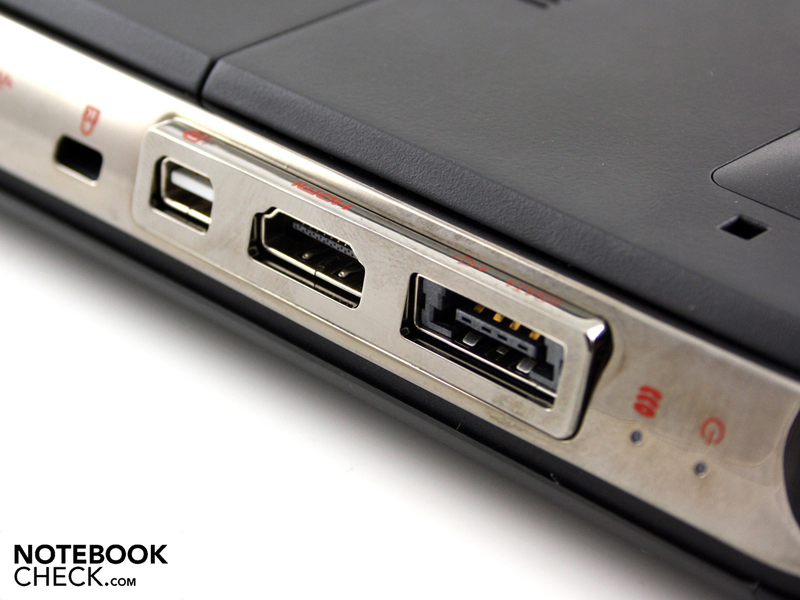 USB 3.0 is still not available, just as little as an ExpressCard slot for expansion cards. Especially the latter would have given the 14 incher more versatility. For example, USB 3.0 or FireWire could have been retrofitted for little money. There is a little socket on the base unit's (bottom) center area. 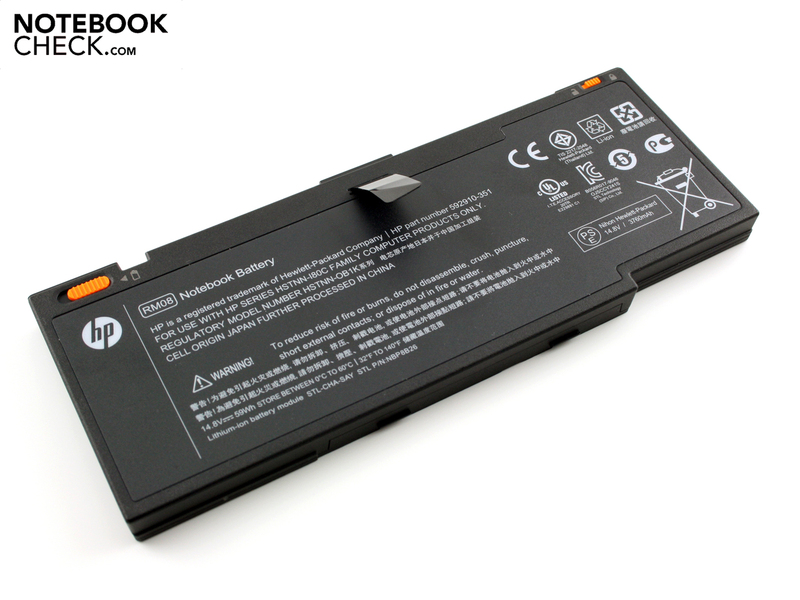 This is a connector for HP's external slice battery solution. 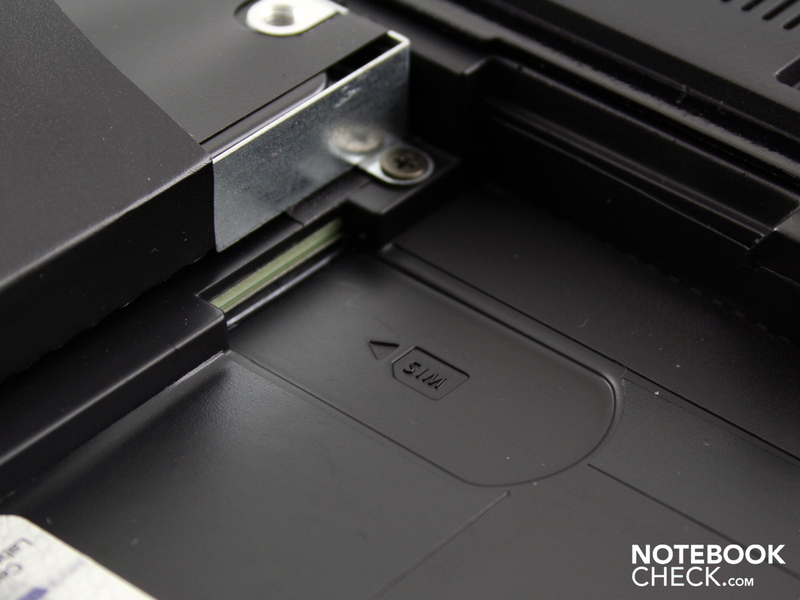 The four slots on the base plate are intended for this option (latch). The omitted broadband modem (UMTS/HSPA) is a pity, although there is a SIM card slot underneath the battery. This should have been included in view of the high price. 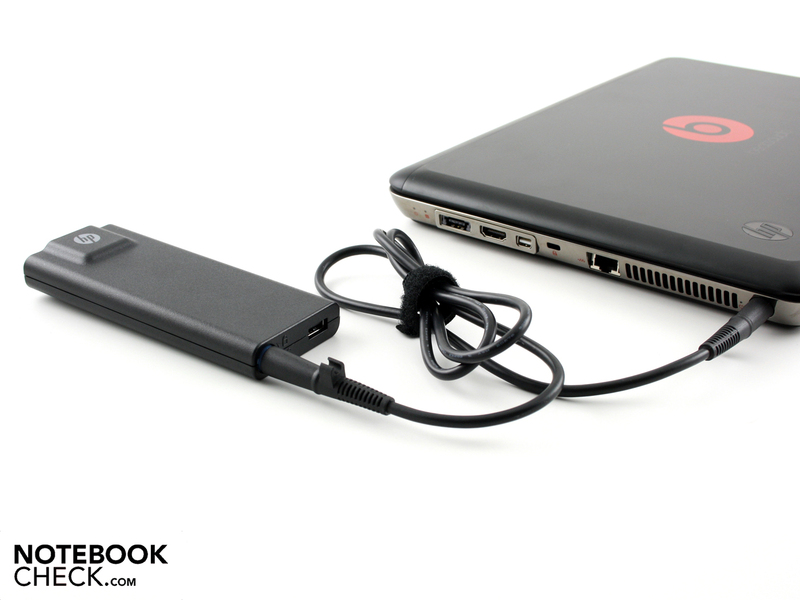 Thus, mobile users have to use an unsightly USB modem, which has to be connected clearly visible on the left or right. 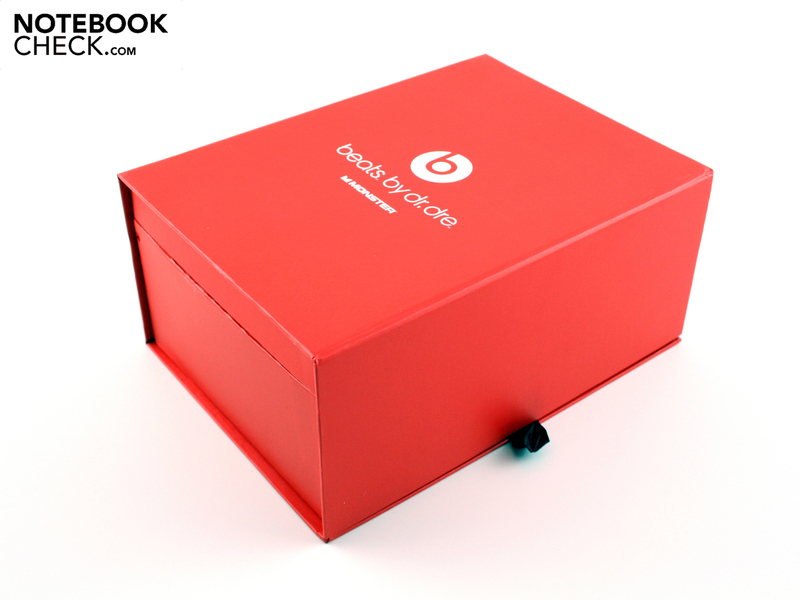 The supplies are dominated by the headphones, with the name "Monster Beats by Dr. Dre Solo HD". These studio headphones are supposed to render the bandwidth and dynamics in high details and with precision. They cost at least 150 euro when bought separately. More about the audio features in the section about loudspeakers. The software doesn't have to hide behind the headphones. Aside from the full versions of Adobe Photoshop Elements, Premiere Elements, Stardock My Colors (customizes the Windows looks) and CyberLink DVD suite, HP MediaSmart Suite is supposed to simplify use of personal media files. Finally, a 2GB SD card (ScanDisk) and a textile cover fall out of the box. The SD cards capacity is rather a joke these days. 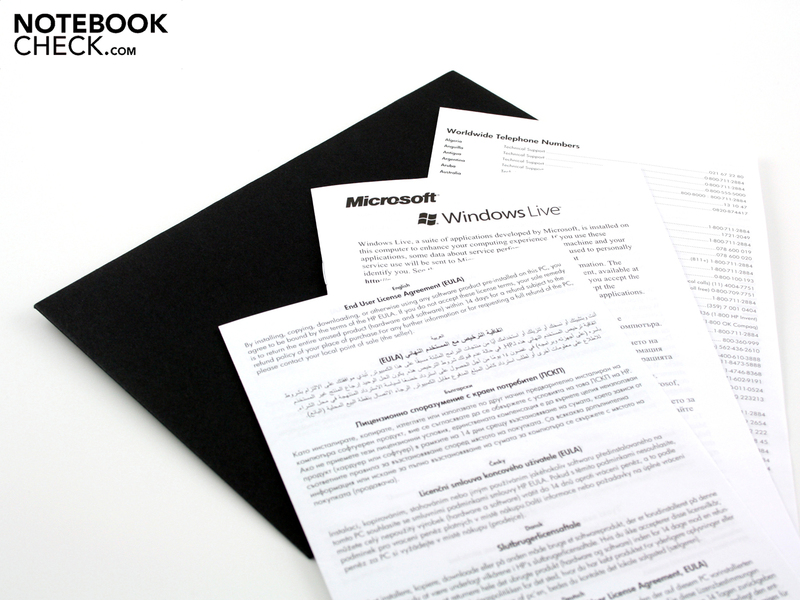 However, it's only for the manual in PDF format. We can't find the quick start mini OS, HP Quick Web (Envy 14-1010eg), anymore. Even the manual doesn't disclose anything about it. 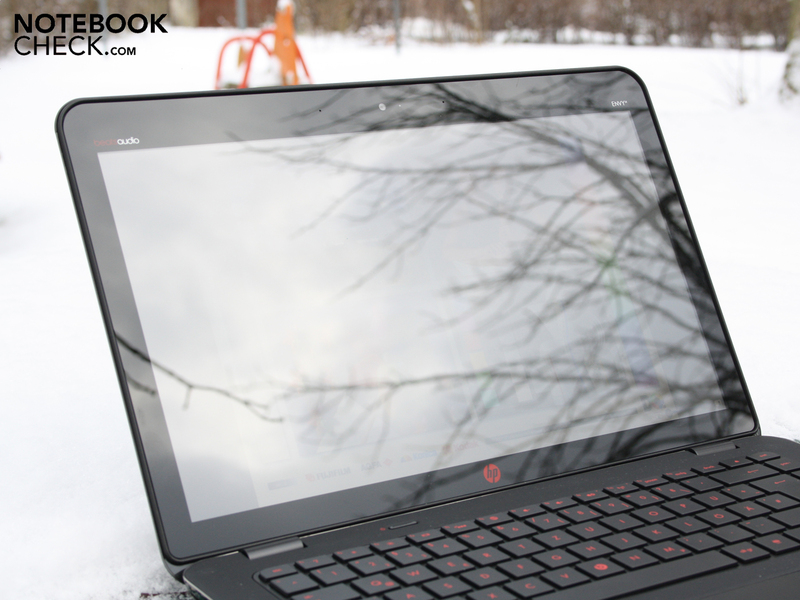 HP gives a 24 month manufacturer's warranty with collect and return service for the Envy 14. A warranty extension for a further year is also available for a surcharge. 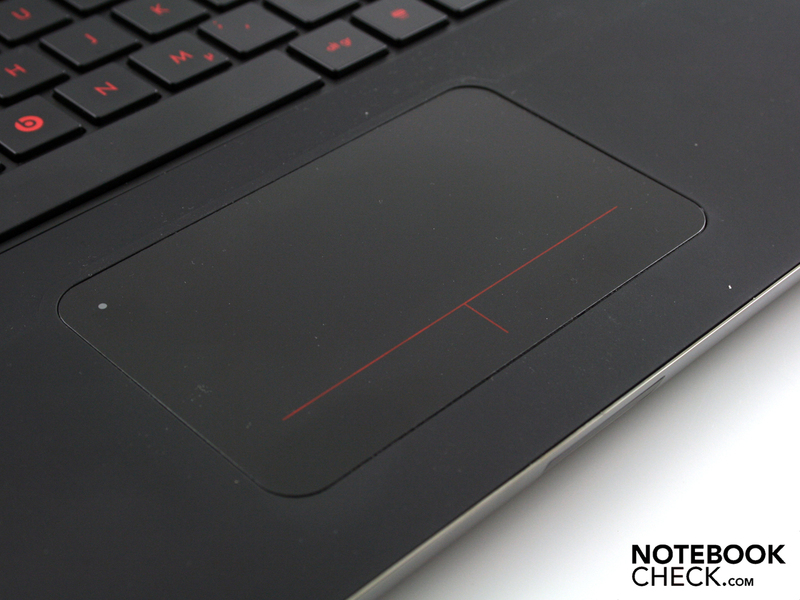 The keyboard and rocker touchpad are absolutely identical with the Envy 14-1010eg from the first review. Clear pressure point, firm stroke and directly accessible control keys could already convince us then. 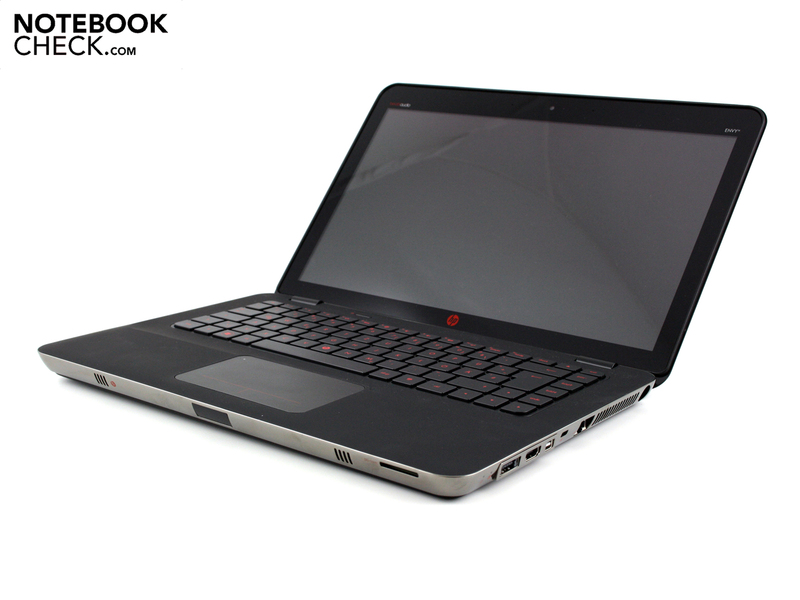 We would refer to the review of the Envy 14-1010eg. 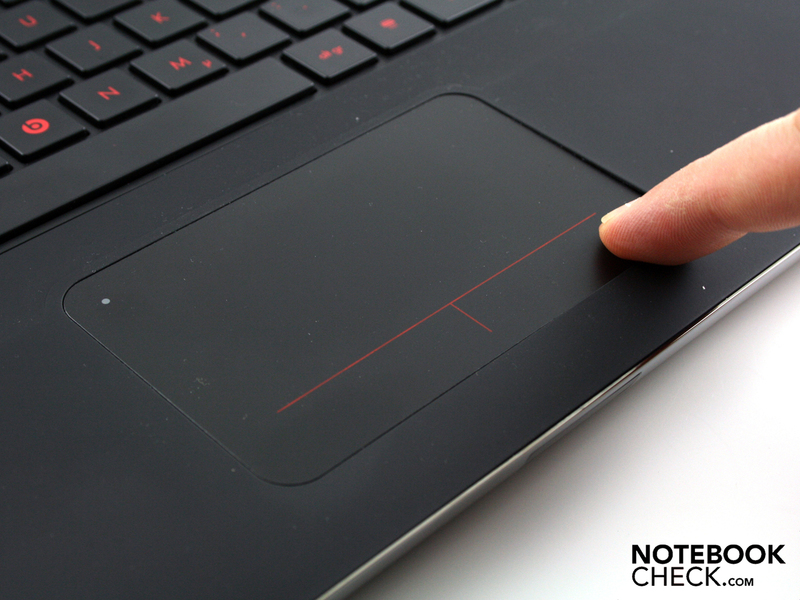 The problem that we had with the pad's multi-touch functions (Synaptics ClickPad v7.4) doesn't seem to be solved. Finger-gestures can only be initiated with difficulty. Instead of the jingling name "LED Radiance Infinity Display", there is now common fare. The 14.5 inch display has a standard resolution of 1366x768 pixels. The glare type screen can be read out as an LP145WH1-TLB1 (manufacturer: LG). The screen has lost all advantages. The contrast is low (164:1), just like the luminosity. Everything that our meters can readout and everything that we see (viewing angles) doesn't exceed a run of the mill office screen. But they are installed in every 400 euro laptop. 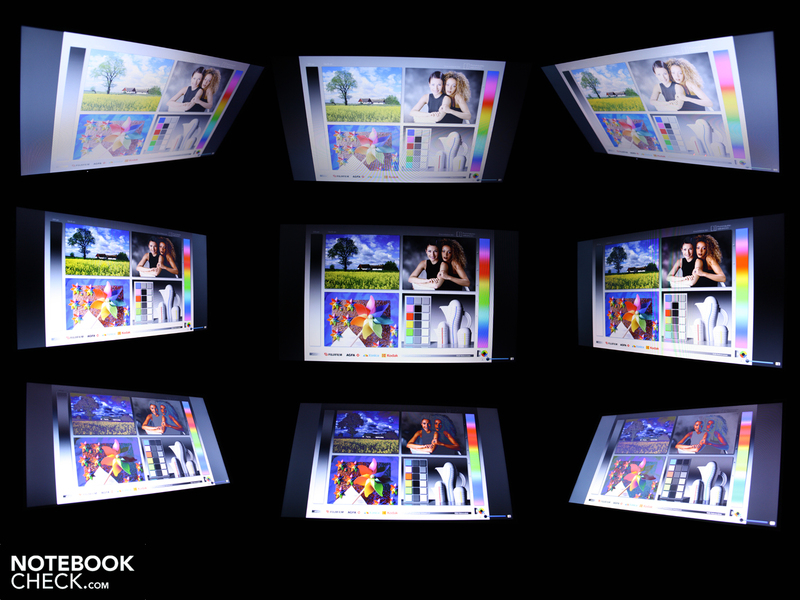 The color spectrum is far away from the Radiance Infinity Display (14-1010eg). Not even sRGB (t) comes close to being covered by the LG screen. The weak color spectrum can be seen best in the comparison to the 14-1010eg. 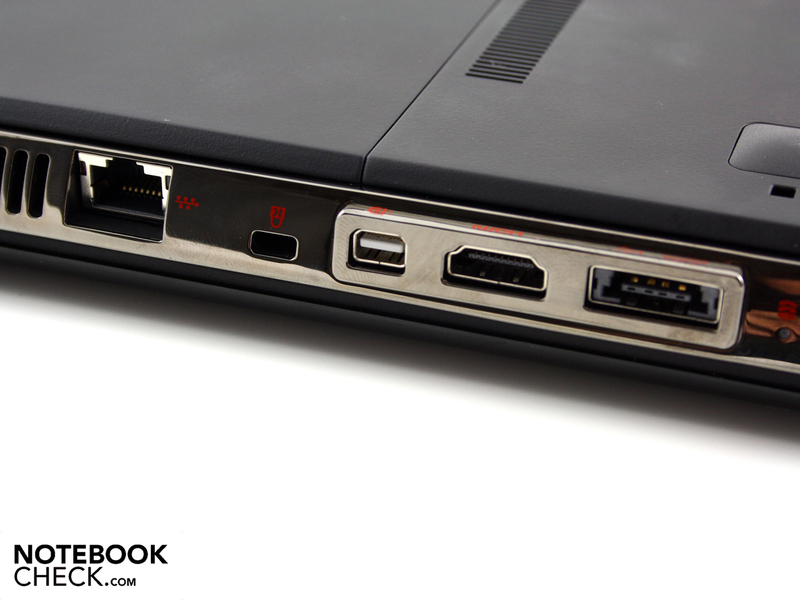 A feature is the mini display port (instead of VGA) in combination with ATI's Eyefinity. Up to two external monitors can be used when one of the monitors is connected to the mini display port and the other to HDMI. Moreover, both external displays can be configured as SLS (single large surface). Two monitors with the same resolution can be combined to one gigantic screen. The brightness is just as poor. We determine an average brightness of merely 178 cd/m2. This is sufficient for indoors, but bright surroundings and dazzling sunlight are a no-go. The display will often be too dark here. We venture a step outside and experience an intensely impaired view caused by reflections. Thus, outdoor use next summer will have to be cancelled. Low brightness and reflections add up to a dreadful mixture. The last criterion for the display is the given viewing angle stability. Thumbs down here. 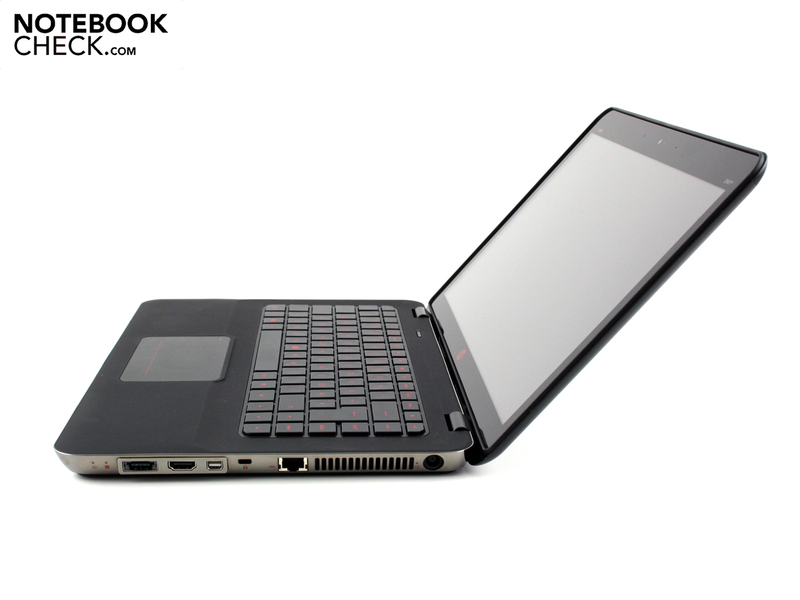 The angles are just as narrow and limiting as in our 299 euro Compaq Pressario CQ56 test device. We can deviate to a maximum of 40 degrees on the horizontal plane. Beyond that, the display doesn't yet dim, but the colors start to falsify (ghosting). This inversion effect already starts at 10 degrees vertically. Colors bleach and the image dims. The color inversions can be seen well on the darkroom picture. We experience the greatest restrictions from a slightly lateral view downwards or upwards. 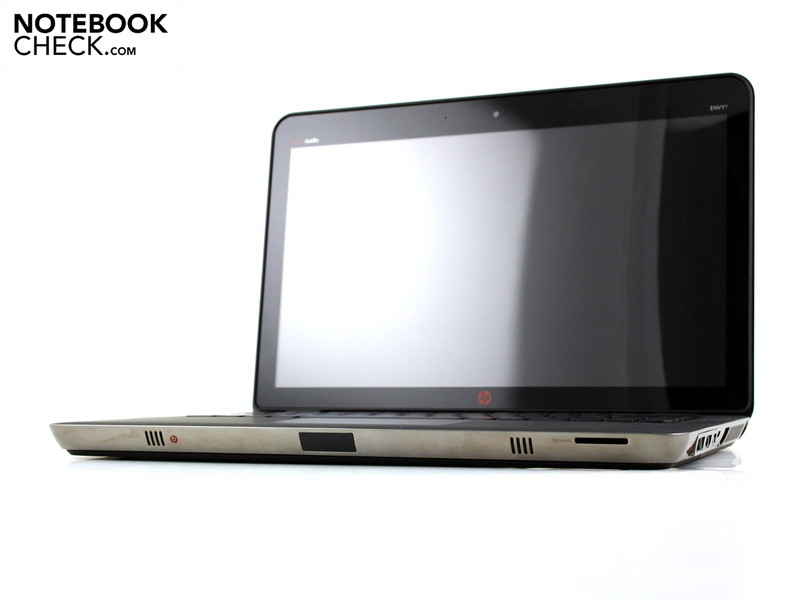 The test device is equipped with an Intel Core i5-560M (2.67 GHz). 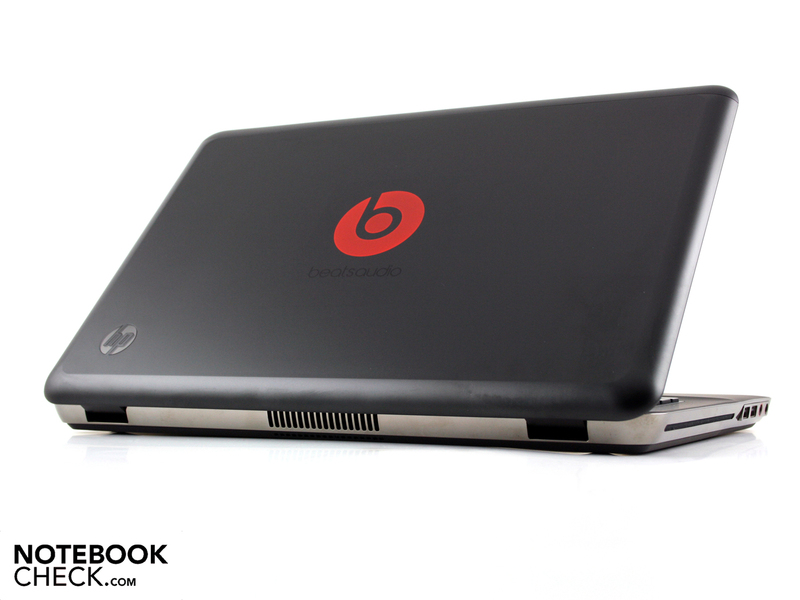 Apart from the 580M (2.6 GHz), it is the strongest i5 processor of the Arrandale architecture. The Core i5 dual core CPU includes features like Turbo Boost (up to 3.2 GHz), Hyperthreading (2 threads per core) and a 3MB L3 cache. According to TDP, the maximum CPU power consumption is 35 watts. In case of load, both processor cores, the Intel HD graphics and the installed memory controller draw on this. 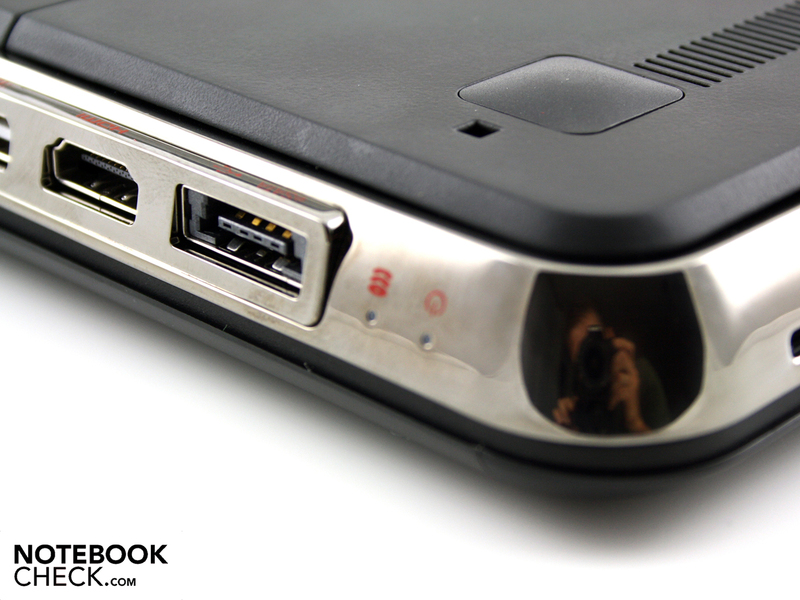 The Intel HD is enabled in the test device and can manually or automatically be switched to the dedicated ATI HD 5650. It is a hybrid graphic, not Nvidia's Optimus (ATI GPU!). 4096 MB of fast memory, PC3-10700 (667 MHz), on the Intel HM55 chipset complement this. It's remarkable that ONE 4GB bar is used. The second bay isn't occupied and accessible via the base plate's second part (up to 8GB DDR3). Due to this, you have to live without the slightly faster dual channel operation. The hard disk comes from Seagate (Momentus ST9500420AS, 500GB) and rotates with 7200 rpm. In comparison to cheaper consumer i5 models (e.g. 460M), the 560M supports Virtualization Technology for Directed I/O, Trusted Execution Technology and AES New Instructions. AES, for example, supports fast encoding and decoding. These features are particularly important for virtual engines, e.g. VMware Workstation 7.1. However, the Communication Suite Test from PCMark Vantage has a speed increase of over 40% with an i5-560M due to the AES function (7794 vs. 4898 points @460M). In particular, Turbo Boost (up to 3.2 GHz on one core) and Hyperthreading (4 threads) are supposed to supply an efficient utilization. What do the processor benchmarks indicate? The CPU benchmarks, Wprime (543 points) are on par with a Core i7-620M (circa 550 points) and above that of an i5-520M. The i5-460M (circa 580 points), which is favorably used in strong consumer laptops, is only marginally slower. The Cinebench R11.5 CPU test (multi, 64bit) scores 2.36 points. This is also faster than a 520M (about 2.2 points), but slightly slower than a 620M (about 2.45 points). Extensive rendering and converting tasks are just the perfect job for the processor. Power users are well-served with it. In view of the fast 7200 rpm hard disk and the strong processor, the subjective work speed is more than only fast. PCMark Vantage allows us to see the system performance (CPU, graphics, RAM, hard disk) in one single figure. The Envy 14 achieves proud 7098 points. That is a remarkable rate, which boosts the 15.6 incher to the 20th place of all recorded PCMark Vantage scores. Regarding the HP Envy 14-1010eg (520M), it is a small advantage of 175 points. 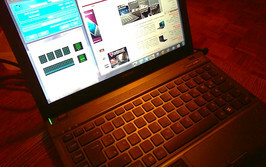 Workstations, such as the HP Elitebook 8540w (620M), or gaming machines, like mySN XMG P500 PRO (640M) move in this range. This ranking community clearly shows that our 14.5 incher is a very strong system. Never touch a running system, says HP and leaves the hard disk unchanged. Even the product label (Seagate Momentus ST9500420AS) corresponds exactly to that of the Envy 14-1010eg. Sony's Vaio VPC-Z12 proved that a fast hard disk can be a turbo for the total system's speed with its two SSDs in RAID 0. HP didn't want to go that far. Nevertheless, the 500 GB HDD rotates with 7200 rpm, which results in a read throughput of 76.3 MB/s (HDTune). CrystalDiskMark 3.0 sees it in a different test routine even more optimistically: 90 MB/s. Thus, the hard disk is in the top range of common mass memories. This is underlined by PCMark Vantage's high HDD score of 4205 points. A slight drawback of the 7200 rpm: The HDD is always audible by a constant background noise. But it's not louder than the fan's noise floor. 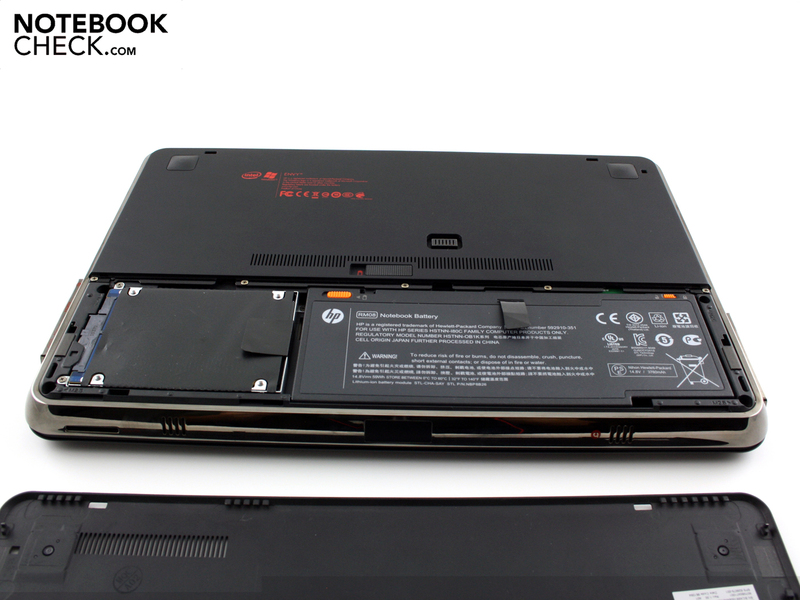 However, there is no hum that is transferred to the desktop, like we experience in HP's ProBook 6540b. HP relies on a dedicated ATI Radeon HD 5650 (1024 MB GDDR3) as usual. As a hybrid graphics, the HD 5650 can be disabled in favor of the Intel HD. As in the first Envy 14 test device, HP has opted for the lowermost limit of possible chip clock rate, so 450 GHz (450-650 are possible, according to AMD). Most models are however clocked with 550 MHz. 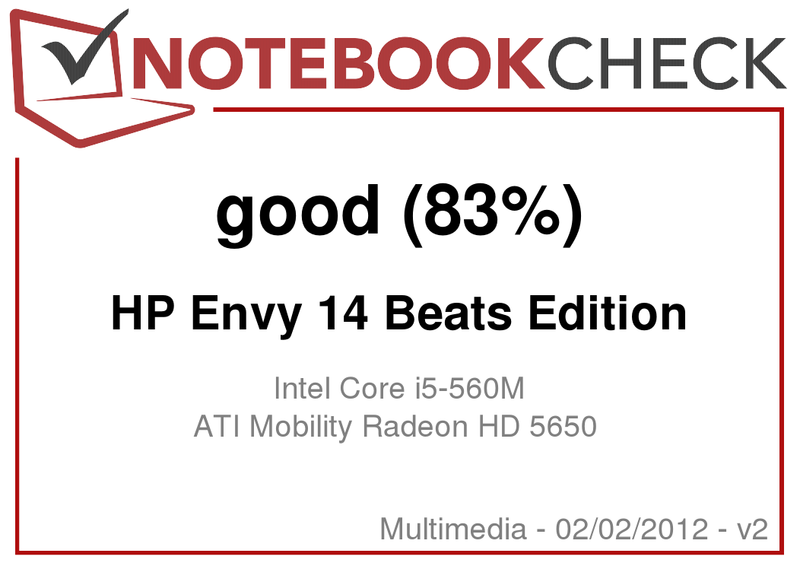 The Envy 14 has to manage with less performance than would be the case with the higher clocked HD 5650 used by all other manufacturers, like Acer, Toshiba, Dell or Asus. How much will the otherwise good midrange gaming capabilities suffer? 3DMark2006 finishes with 6314 points. 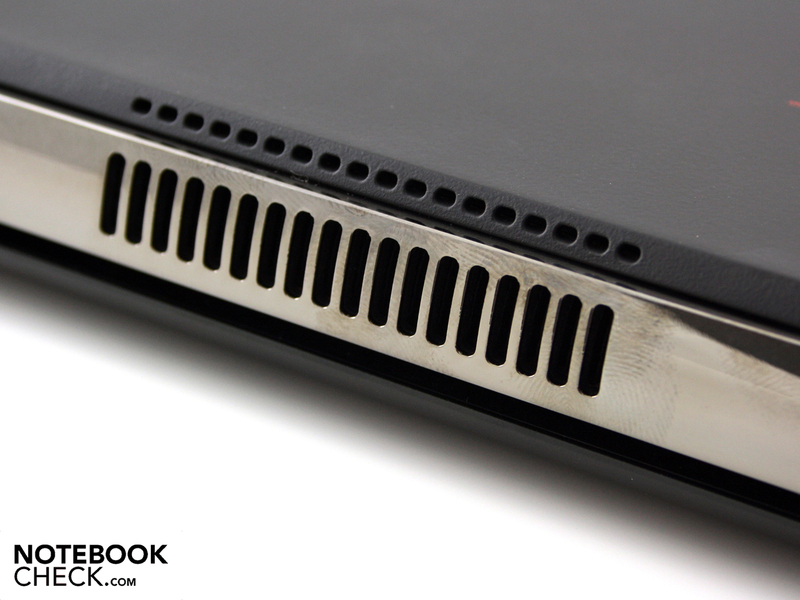 The same core, in Aspire's Timeline X 3820TG (i5-460M, 550 MHz), can achieve 6754 points. It could even be 7076 3DMarks06 with i7-720QM support (Deviltech Fire DTX). We've tried out the following three demanding games. The throttled HD 5650 (450 MHz) proves to be a drawback in games. The Aspire 3820TG-5464G75nks (460M) achieves 29.1 instead of 26.6 fps in StarCraft 2 (high). This might just be the boundary of playability. The Aspire 7551G-N934G64Bn (AMD N930) could achieve 27.1 rather than 25 fps in Metro 2033 (medium). The difference in Risen (medium) is striking: Dell' Studio 1749 (520M) reaches 44 opposed to only 29 fps. No matter how you look at it, the fervent gamer pays attention to every single frame and won't be satisfied with the 450 MHz alternative. The strong processor doesn't help much here, either. Casual gamers, however, will still get a graphics that can render current games fairly smooth in medium details anyway. 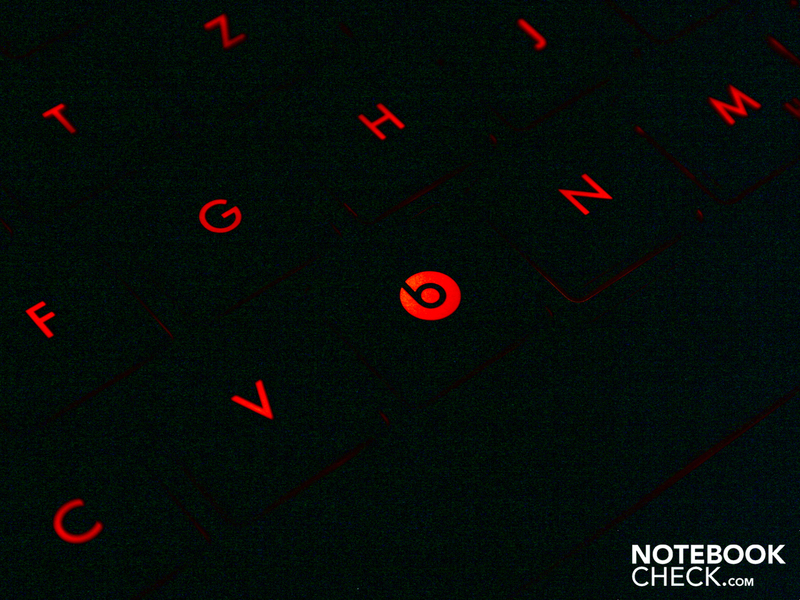 Ergonomics isn't one of the Envy 14's strengths. The fan noise is always present because the active cooling is never disabled. The noise level never sinks below 33.3 dB(A) in idle. It's no matter if the Intel HD (battery mode) or the HD 5650 (AC mode) is enabled. Random computing tasks (internet surfing, moving documents, opening Excel) are enough to disquiet the fan and increase the level up to 42 dB(A). When the processor has to calculate with all four threads (Prime95) and the HD 5650 operates all shaders (Furmark), the fan increases to a very audible 47.6 dB(A) (stress test). This high noise is very dominant, but runs consistently. The Envy 14-1190eg only reaches a noise level of 40 dB(A) during computer games. This is likely due to the Radeon graphics card's lower TDP (about 15-19 watts) in comparison to the 560M CPU (35 watts). The base unit's top and bottom temperatures are always within the blue range in idle without noteworthy load and don't even exceed 25 degrees. The entire case feels very cool in this state. This only changes notably on certain "hotspots" under load. The stress test measurement recorded up to 38 degrees on the top. 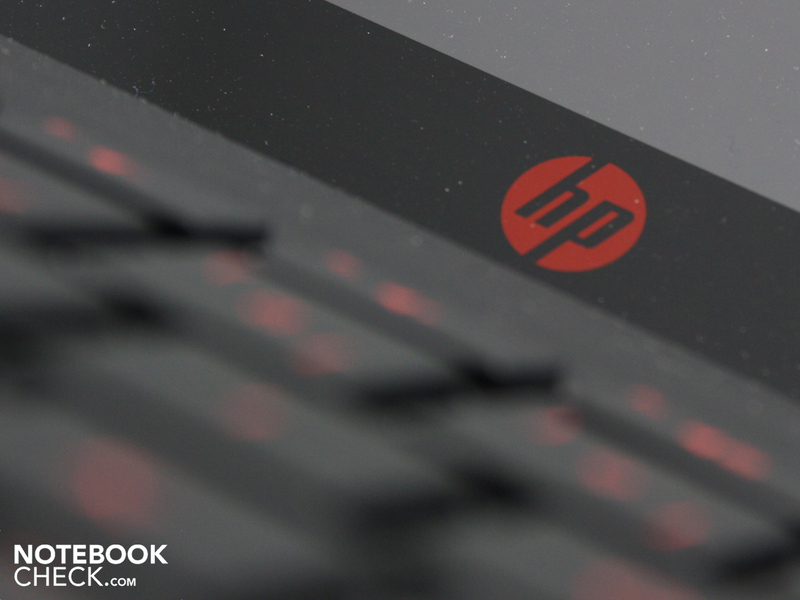 While this provides warm fingers on the right, the left keyboard half stays very cool with 24 to 28 degrees. The bottom doesn't exceed 37 degrees, whereby the average is only 29 degrees. The CPU's temperature increased to a maximum of 81 degrees during the stress test inside. The GPU settled to only 66 degrees. The latter could be due to the HD 5650's low clock rate of 450 MHz. (+) The average temperature for the upper side under maximal load is 28.5 °C / 83 F, compared to the average of 30.9 °C / 88 F for the devices in the class Multimedia. (+) In idle usage, the average temperature for the upper side is 22.1 °C / 72 F, compared to the device average of 30.9 °C / 88 F.
What is Beats Audio? It is an audio profile with bass enhancement with a concurrent clear sound. The profile is standardly enabled and can be increased or decreased via FN+B (Beats Audio symbol). 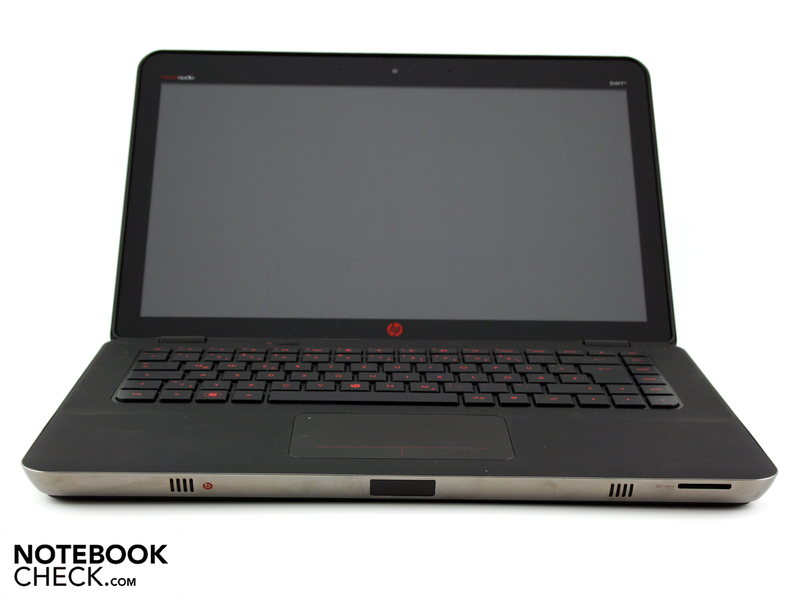 The IDT 92HD81B1X Audio Controller is hardly used in notebooks. 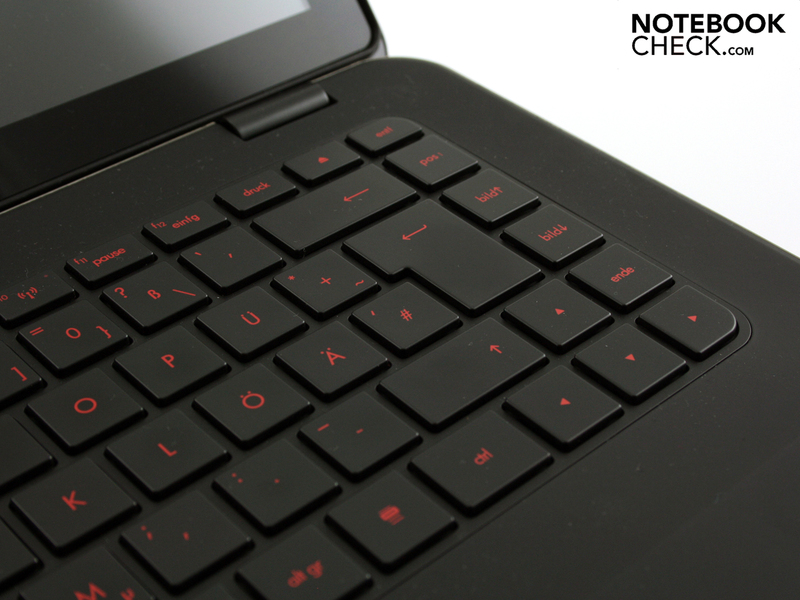 We only know of the Dell Inspiron 1440 (basic notebook). Although the supplied basses can't keep up with a subwoofer system, the balanced sound is impressive. The basses can be perceived to some extent, the mids are balanced and the trebles are acceptably rendered. 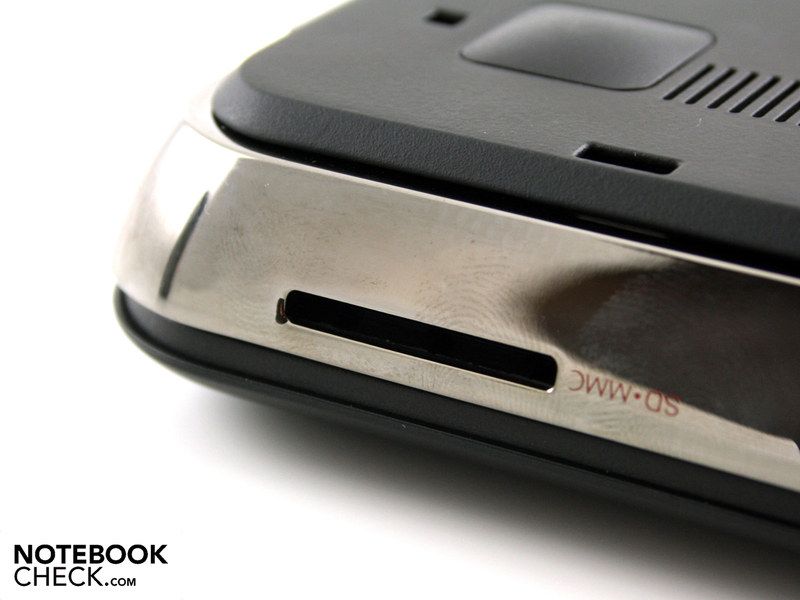 It's surprising that the sound is emitted from both tiny openings on the notebook's silver front. The maximum volume is good, but not particularly powerful. 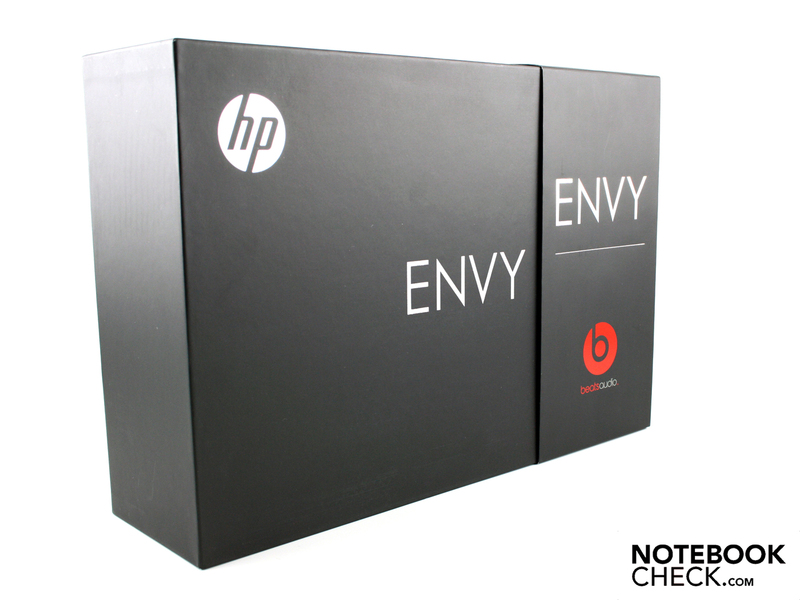 The sound has improved considerably in opposition to the successor, Envy 14-1010eg, whose packaging already displayed a "Beats Audio" logo (it was treble-heavy). Now to the striking Dr. De Dre studio headphones. The Monster Beats Solo HD provides a very good sound and seals the ears with soft ear cups very well. 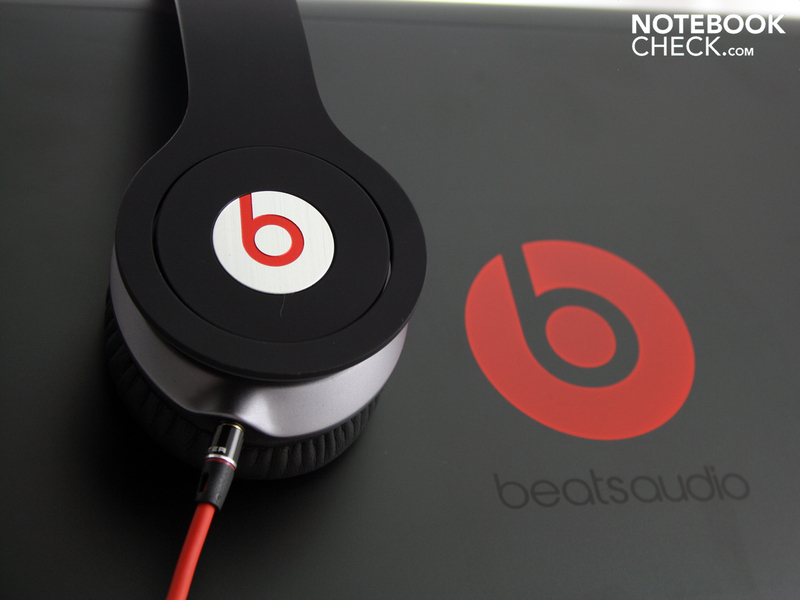 The Monster Beats' maximum volume is so great that you may experience hearing impairment. 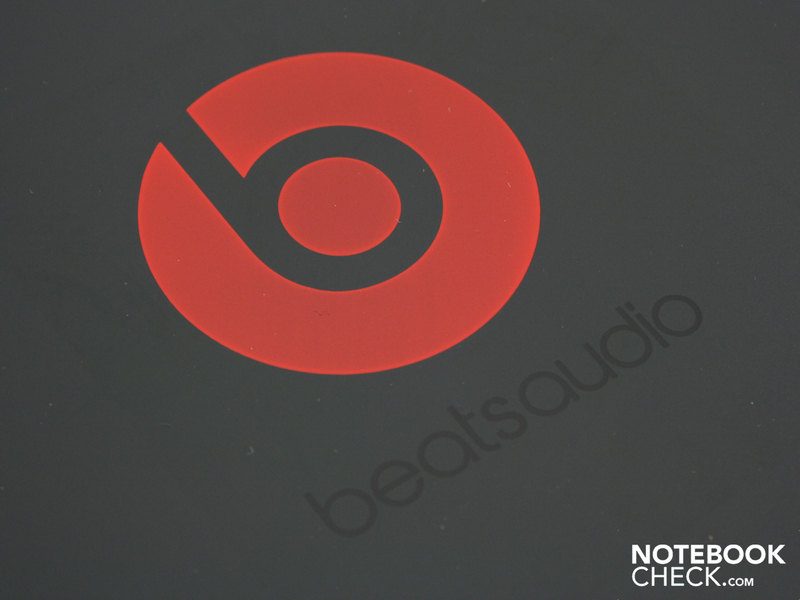 The Beats Audio profile has the least influence on the headphones and appears to be optimized for the installed speakers. There is something special about the cable (removable). The black "Control Talk" just in front of the ear cup has a microphone and answer button. This allows listening to music and telephoning without having to dig around in the pockets. The music has to originate from Apple 3Gs iPhones, IPod Shuffles and other iPods or similar devices. 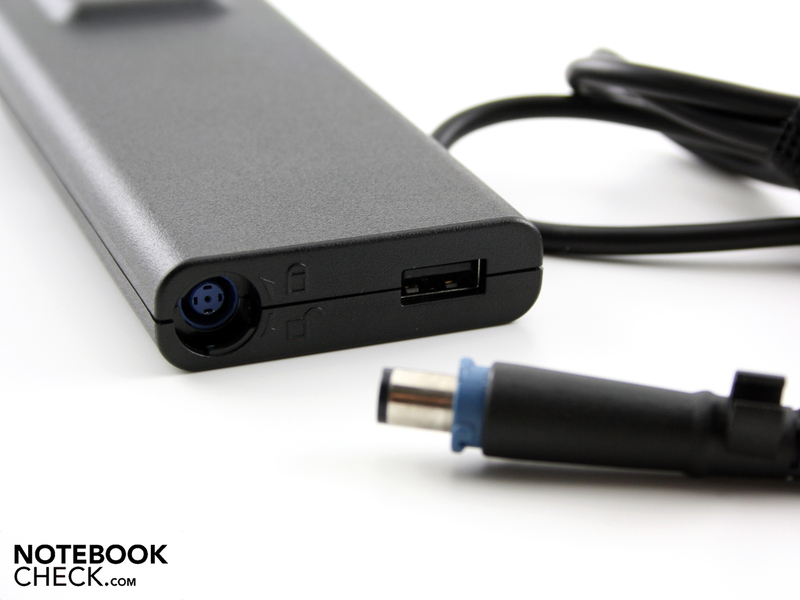 An 8 cell lithium ion battery with a capacity of 59 Wh (3760 mAh) is the same as was used in the Envy 14-1010eg. The battery runtimes have neither worsened nor improved. Differences of 10 to 20 minutes are within the measuring tolerance, particularly in the WLAN test. The second figure in brackets originate from the 14-1010eg. The 14.5 incher lasts for three and a half hours (213 minutes; 235) during WLAN surfing. If you watch a DVD movie on the go, you'll easily cope with 3:29 hours (209 minutes; 215). That's enough for almost two movies. Undemanding users can increase the idle battery life up to 4:31 hours (271 minutes; 263) (BatteryEater's Reader's Test). The Intel HD was enabled and the dedicated HD 5650 disabled for these three tests. When the procesor is put under load, it is evident that there's no difference between the Envy 14 models in terms of power consumption: 1:06 hours (66 min; 60). We left the ATI HD 5650 enabled for this test. The 90 watt adapter needs 2:06 hours for a full recharge. Our test device hasn't improved in matters of idle power consumption. 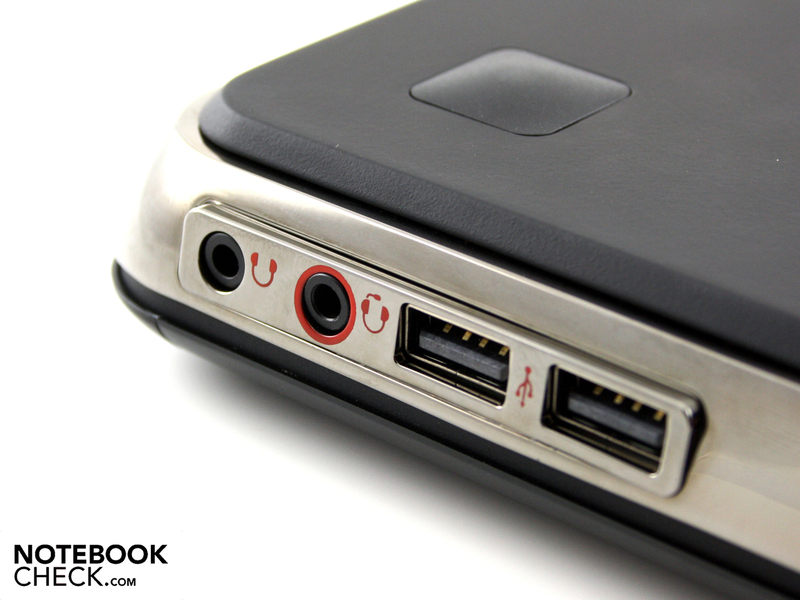 The Envy treats itself to a power consumption of at least 13.3 watts (rather than 11.4 watts) with enabled Intel HD. It is 16.4 watts (instead of 14.5 watts) with the HD 5650. Thus, the Intel HD saves the system about 3 watts, which are available for a longer battery runtime. The power consumption increases up to 77.7 watts under high load set off by the stress test (CPU & GPU 100% load). The 90 watt adapter copes well with that. It heats up to 54 degrees, which is acceptable. The multimeter indicates 54 watts when only the 560M CPU is demanded by Prime95. 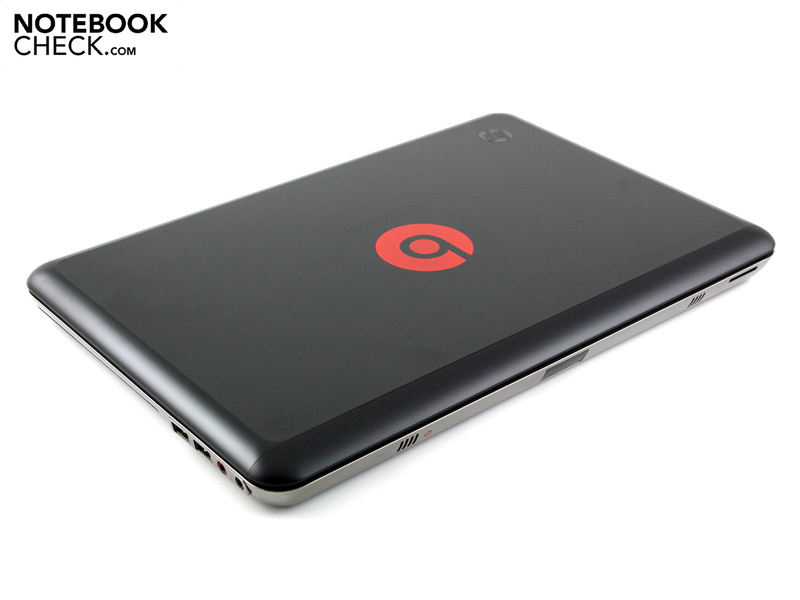 Alike the first Envy 14 incher, the 14-1190eg Beats Edition can serve with first-rate stability, an attractive case and high-end equipment (input devices, interfaces). 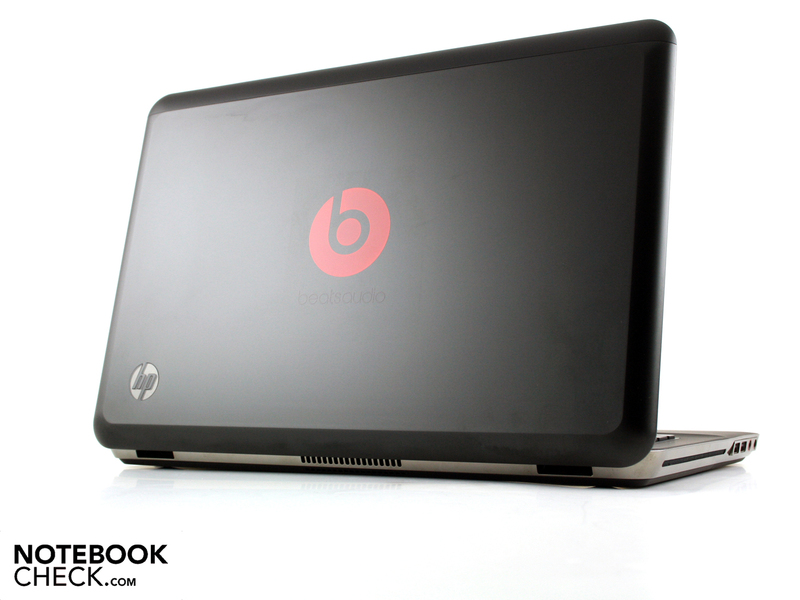 The performance, with the high clocking Core i5-560M, is apt for demanding applications, like video and sound editing. The system performance is exceptionally high due to the fast rotating 500 GB hard disk (20th place in the ranking of ALL notebooks). A drawback for gamers is the Radeon HD 5650 clocked down to 450 MHz. It is measurably not as strong as the 550 MHz counterpart. The high performance can be cooled by an efficient, but always audible cooling system without ado. The battery life of about three and a half hours isn't close to being a high-flyer, but can be called viable. 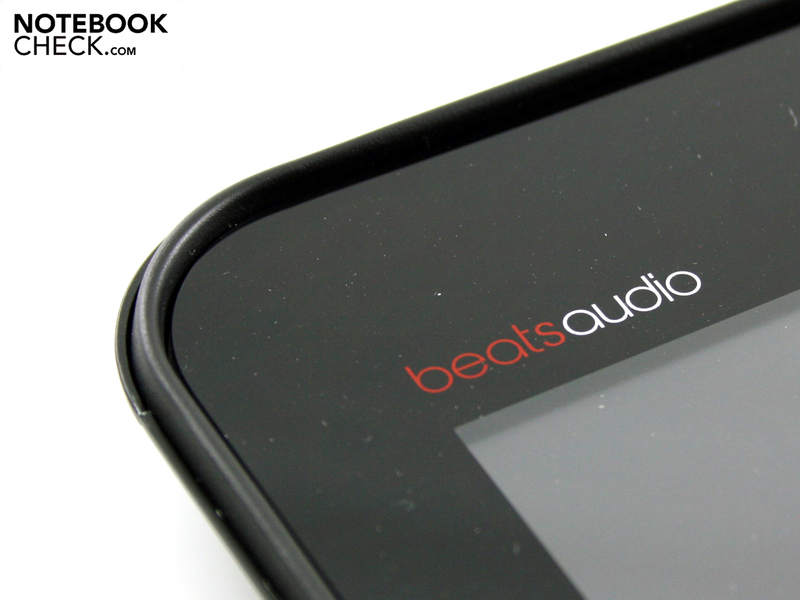 Moreover, the Beats Audio sound profile together with the installed speakers provides a balanced sound, including a few basses. However, after so much praise, a clashing argument for the 1800 euro notebook follows. The 14.5 inch display could hardly be more substandard. It is on par with 400 euro-budget office laptops with its low contrasts, tight viewing angles, narrow color spectrum and below average brightness. 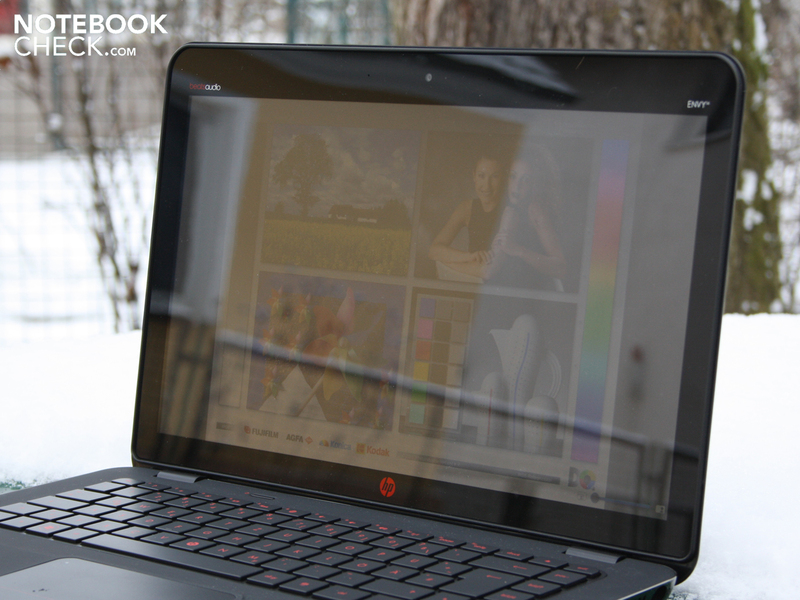 All good qualities of the LED Radiance Infinity display of the HP Envy 14-1010eg have been eradicated in the 14-1190eg Beats Edition. Too bad, because just this display would have made the Envy 14 to a unique notebook. In view of this, it's almost no wonder that our test device (delivered by HP) is hardly listed in any shop. 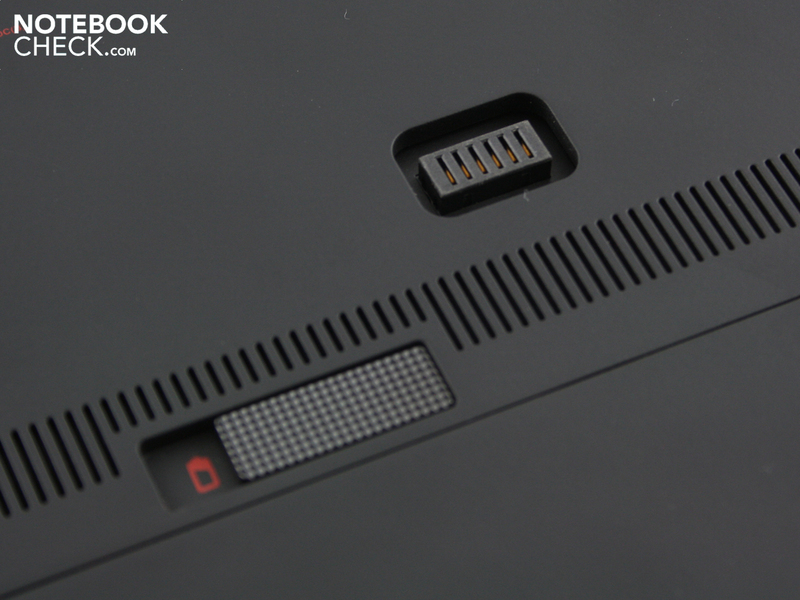 but also the interface for the battery slice can be seen (no docking port!). 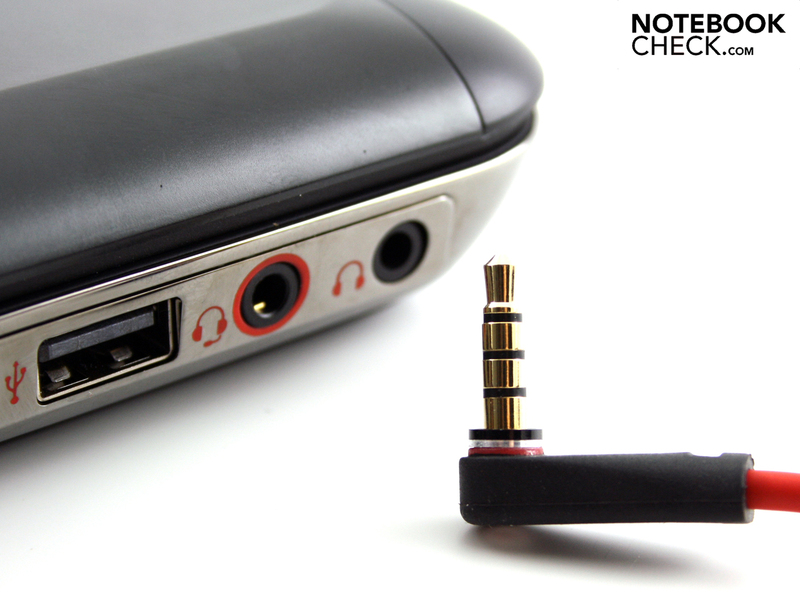 A microphone can also be connected to the red audio port (or a headphone). There is a mini display port instead of VGA. A cardreader for SD/MMC is also installed. The base plate can be pushed open on one half. A flat battery is found underneath. The 59 Wh cells can be removed. 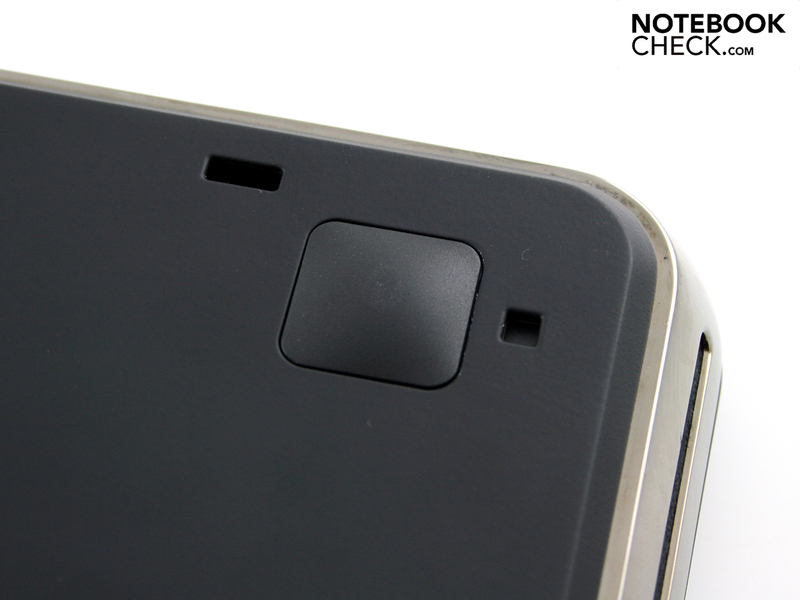 Beneath that, there is a SIM card slot. Our model didn't have a broadband module, though. What is inside of this official-looking envelope? Nope. 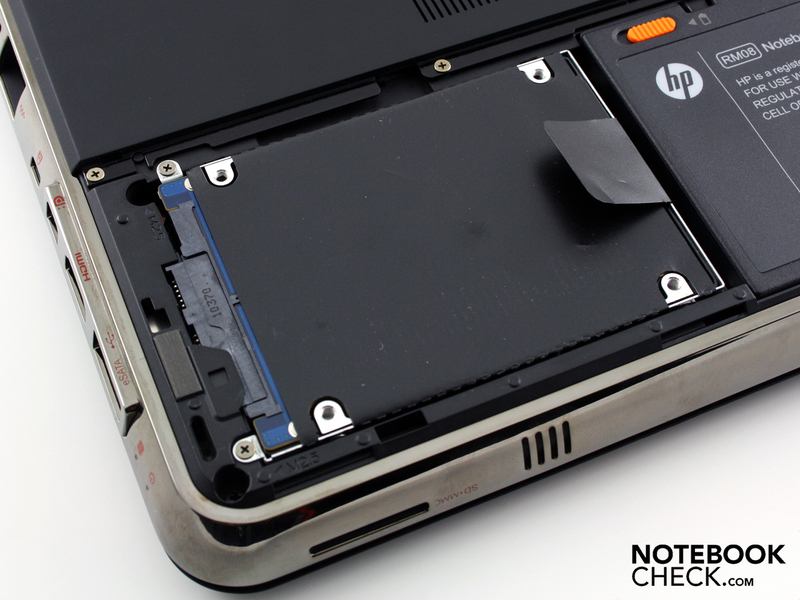 No HP share package – only the warranty conditions. 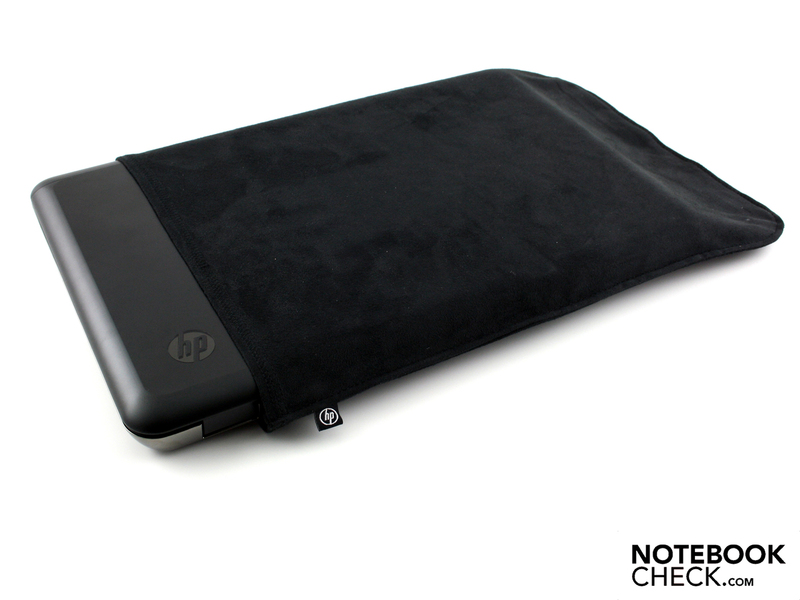 The protective cover prevents scratches. The latter provides intense reflections in daylight. The flat adapter recharges the battery within two hours. 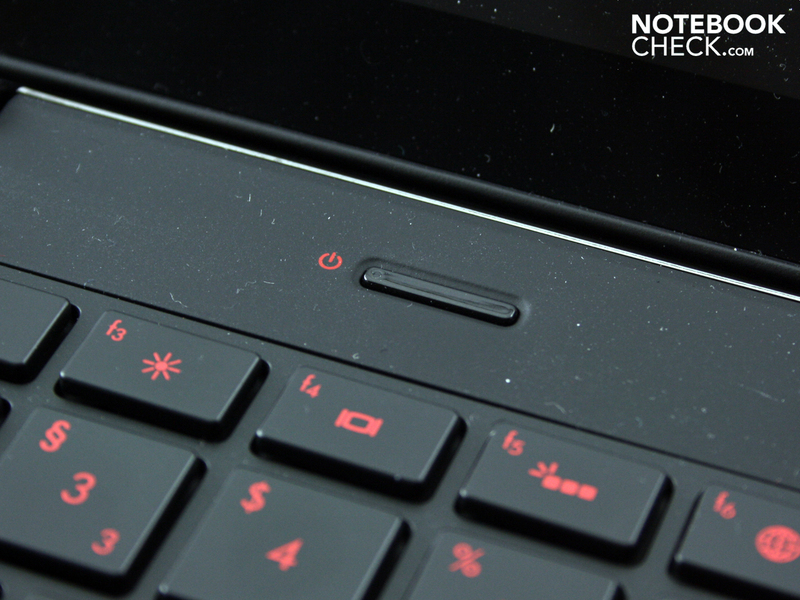 The tiny power button is the only key outside of the keyboard. 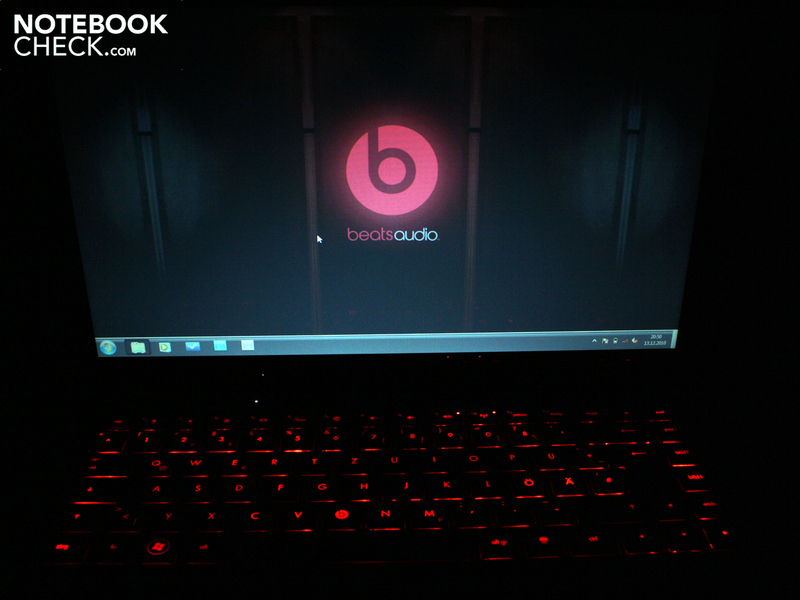 What is in the Beats Edition? More importantly: What extras can we await? 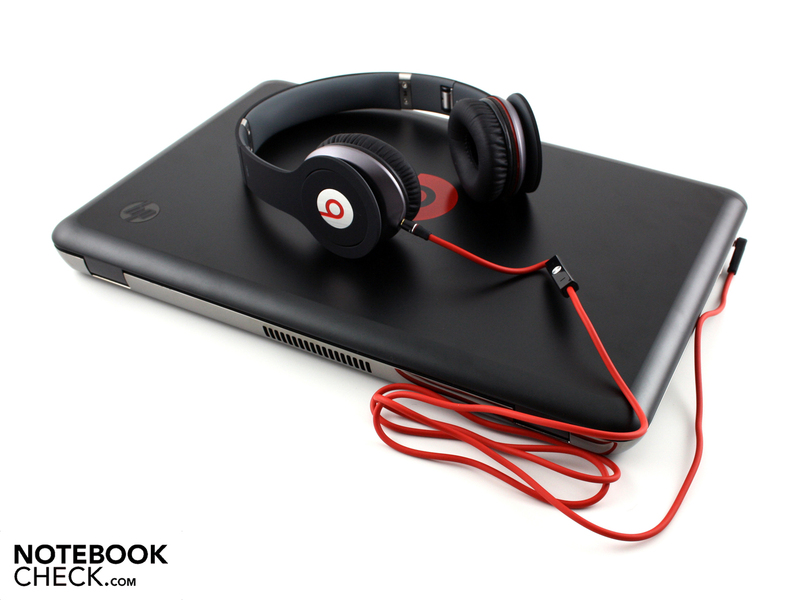 Uncompromising sound quality with the "Monster Beats by Dr. De Dre Solo". The studio headphones cost at least 150 euro. Jack (gold plated) and cable are very high-end. as well as a Radeon HD 5650 (450 MHz). The chrome bar around the base unit is susceptible for greasy fingers. 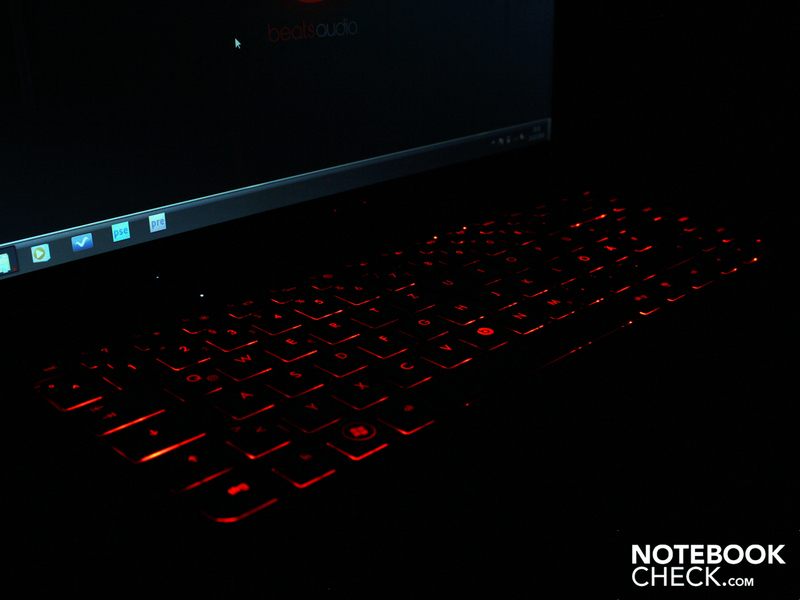 In return, the illuminated keyboard is very pretty. No one will hit the wrong key in the dark. The protruding rubber edge closes flush with the work surface. USB rechargeable devices can be recharged with it. A compact, stable and haptically pleasant base unit. Our hands feel very comfortable on the rubber-coated work surface. A high-end or at least good display. The Radiance display could have at least been replaced with a viewing angle stable screen, as they are found in some HP workstations. Here is a notebook that practically can't be bought anywhere.